Unfortunately, SDOT’s current design (east end pictured above) does not realize the overpass’s potential to improve pedestrian access to transit in Sodo. The east end of the new overpass will be one long block from a Link station. The overpass will be the primary walking route from transit to Starbucks headquarters and numerous businesses along 1st Ave S. If a new Sodo arena is ever built, the overpass will also be the primary walking route to the arena. But, despite the obvious usefulness of the overpass to non-drivers, it has four general-purpose lanes, while restricting pedestrians and bicycles to a single mixed-use path along the north side of the bridge. Sidewalks on the south side would come to dead ends, without providing any way for users to access the mixed-use path except returning all the way to 1st Ave S or 4th Ave S. This is not good enough. SDOT needs to provide safe pedestrian access on both sides of the overpass, not force south-side pedestrians to backtrack a few hundred feet just to access the overpass safely or to make more crossings. If the design has to be reduced to three general-purpose lanes to provide safe pedestrian access on the south side without increasing project cost, that is a worthwhile tradeoff. New infrastructure should be built with no-compromise access for sustainable modes of transportation. If built that way, the Lander overpass could be a valuable improvement to sustainable mobility, rather than an enduring symbol of missed opportunity. doesn’t seem to be any justification for 4 lanes instead of 3.
is there any reason for 11ft lane widths? whats the design speed? guessing its 40-50mph? 14 ft multi-use paths are the only thing bellevue builds. dangerous for walkers and bikers both. much less safe than sidewalk + bike lane. Bellevue has multi-use paths? Where? And why are they dangerous and less safe? Current Lander street is 7 lanes – 2 parking, 4 through, 1 two-way-left. It’s a safe assumption that 4 lanes in this location is largely to accommodate queueing for the stoplights at 4th and 1st, particularly for the left turn movements. It’s not uncommon currently to have stoplight queues in both directions stretching across the railroad tracks. As for the 11 foot widths, I suspect it’s driven by the large amount of semi truck traffic. From edge of mirror to edge of mirror, a commercial truck can be up to 10’2″ wide. What I don’t get is why Seattle Public Schools needs to preserve their Lander st. driveway. They already have 5 driveways on 3rd Ave, and they don’t even use all of those – they block the northernmost one with a dumpster. If the SPS driveway goes away, then there’s no need for the access road south of Lander, and there’s plenty of room to connect the southern sidewalk. Strongly disagree with that statement, especially in SODO with very few pedestrians or cyclists. The 12″ish multituse path with landscaping and fencing on either side along 99 in north SODO feels incredibly more safe than the south section that has one sidewalk with no planting strip and buffered and bollard bike lanes on the 45mph freight road – its night and day difference in safety for both the cyclists and the pedestrians. Burke Gilman and the Greenlake trail are the level of both kinds of traffic that it feels like there needs to be separation – reaching congestion. But you’d still be hard pressed to find deaths of either person or bikes on the BG trail – its more annoying than it is dangerous. Wide well seperated multiuse trails are absolutely better for SODO. Limiting your view of the inherent dangers of MUPs to pedestrian/cyclist fatalities makes for an awfully low bar to clear. We can do better. This part of Lander street is designated as a Major Truck Street in the freight master plan, so wide lanes are going to be part of the plan. It’s also designated Major Arterial. A lane diet would have had to be explicitly part of this plan, and I’m not convinced it would have been possible. Reducing 7 to 4 is a start, along with a protected ped/bike path (where, reminder, there is no such thing even remotely close right not). The points of the author are totally valid that it is not the best solution for pedestrian mobility, but there are so many other stakeholders who stand to benefit that it’s hard to really argue with the result. I think this is what a public process is reasonably expected to produce: good for everyone, perfect for no one. I just think any plan in which we reduce from 7 to 4 lanes, and STILL lose a sidewalk, is inherently flawed. The loss in travel lanes is not necessarily an impact for vehicles since there is no longer a need for queuing space from waiting for trains. The project is perfect for cars and trucks, but is far from perfect for bikes and peds. There are engineering challenges related to some of the businesses on the south side of the street having no alternate driveways other than directly onto Lander (particularly on the west side) and the bridge clearance not being acceptable to still be proper ROW for entry and exit: This is why the bridge isn’t centered on Lander street as it presently exists. A pedestrian crossing of the train tracks along the south side of the street won’t be maintained once this is done, either. I agree — flawed, but I believe also entirely acceptable. The only business whose only access is from Lander is Pacific Galleries, on the east side of the tracks. To retain access to their dual driveways, only a short stub of a frontage road is needed, not the long L-shape that loops under the overpass with “parking beneath”. If that frontage road were to end immediately after the Pacifica Galleries driveways, instead of continuing on to give SPS a sixth redundant driveway, its sidewalk could then use the freed space to rejoin the overpass via a ramp or stairs, and the overpass could be widened at that point to accommodate. On the western size of the tracks, zero driveways will be preserved. Even the intersection with Occidental is being blocked. Access to the Lander Station or South Lander Business Park stripmalls / office parks will require traveling out to 1st and looping around the block to Occidental. Is this going to be a viaduct like over Spokane Street and Atlantic Street? Are the four lanes going to be elevated, or just a pedestrian bridge? I’m getting confused about what’s going to be “overpassing”. If the road is elevated with parking underneath,. why can’t pedestrians walk north underneath it? If the road is not elevated, why is it called an “overpass”? This is an overpass similar to (although much shorter than) the Airport Way overpass over the same tracks. Pedestrians can’t walk underneath because there will be no way to cross the train tracks at surface level. So you won’t be able to walk west on Lander Street between 4th and 1st anymore? You can, you just have to walk on the north side of the street. Does anyone have any valid data on the number and length of closures due to trains? I lived nearby for 25+ years, and used Lander crossing thousands of times. My observations — train crossings are few and short. Even a 1.3-mile-long coal train passes in maybe 3-4 minutes. I’ve seen long delays there. Sometimes trains even stop and go on the other direction. 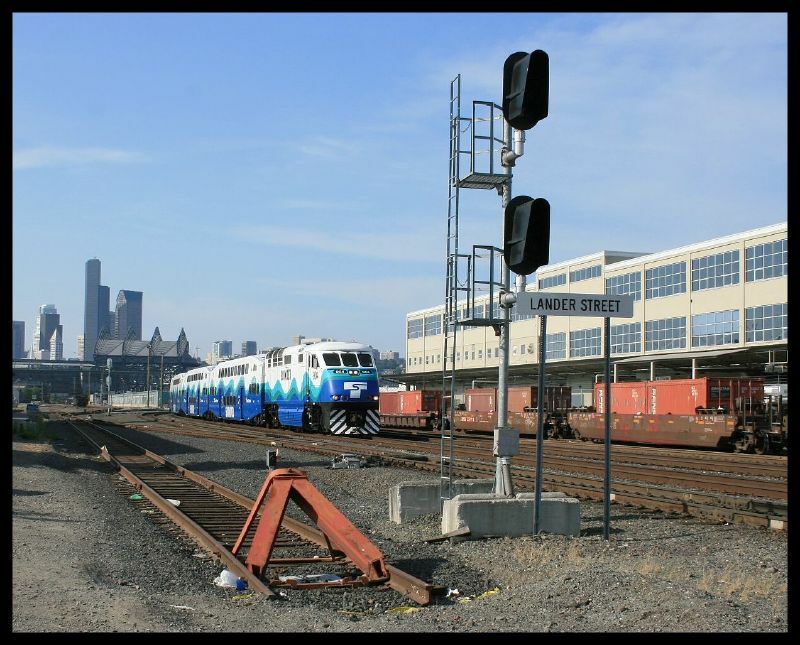 The overpass may be particularly useful to Sounder and Amtrak because they no longer would have to worry about their trains blocking Lander. I’ve been delayed there on the 21 twice this year, for 15 minutes or so. There’s plenty — the worst days have aggregated closures on the order of 3-4 hours. I see the bid documents for the project are posted to the city’s ebidexchange.com in case anyone wants to get into the detailed layout of the plans. Engineer’s estimate for the bid is shown in the system as $43 million to $48 million for the chunk of work being bid. Bids are due 9/20 at 2pm. David, are you saying that the BNSF right-of-way will be fenced off after the overpass is built? That people won’t be able to cross the tracks on foot? If that’s the plan, and there is to be “Parking Underneath”, then put a pair of staircases along either side the tracks or ramps that have a “landing” halfway up the main structure just north of it. I can’t imagine either would cost more than a couple of million dollars, even in our Cadillac economy. That’s my understanding, Richard. And provided that there are reasonable sidewalks on the surface level of the south side on both sides of the tracks, which it looks from the plans like there will be, I’d be much happier with those staircases than with the current plan. There will be no sidewalk on the south side of the street, elevated or surface, which passes the Pacific Galleries building. The south side frontage road will have no sidewalks – 100% of the public right-of-way between the overpass and the PG building will be vehicular space. A short stub sidewalk will exist on space that is currently part of the Pacific Galleries & Republic Services parking lots, just long enough to get people from 3rd Ave S to the Pacific Galleries front door on the parking-lot facing side of the building, where it will dead-end into the side of the building. The under- crossing path with stairs would be a good solution. I’m not sure if an ADA elevator would also be required or not. Response to Richard B right above me. I’m sad this is the solution arrived to by SDOT. Pedestrian access should be provided on both sides of the bridge.